The Time Capsule (メモリアル・カプセル?, lit. 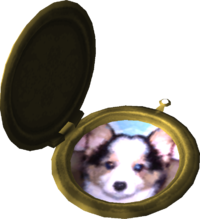 : "Memorial Capsule") is a treasure in Pikmin 2 and is actually a golden locket with a picture of a Shetland Sheepdog. It is found on sublevel 4 of the Citadel of Spiders, and some enemies may need to be defeated once it is found. 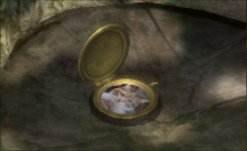 The Time Capsule contains a picture of a house cat instead of a dog in the Japanese version. A White and Purple Pikmin hold up the Japanese version of the Time Capsule. The Time Capsule being analyzed. The Time Capsule being analyzed in the Japanese version. The Shetland Sheepdog in the European and American versions could be referencing the fact that Shigeru Miyamoto's got a dog, called Pikku, in 2001. The relation between the name Pikku and "Pikmin" could've inspired the change. This page was last edited on December 12, 2018, at 09:20.